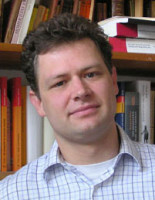 Christian Wendt is Professor of Ancient History at Ruhr Universität Bochum. He studied history, law and journalism. In 2006 he received a PhD with a thesis on ancient Roman foreign policy (Sine fine. Die Entwicklung der römischen Außenpolitik von der späten Republik bis in den frühen Prinzipat, Berlin 2008). Since 2009 he has been director of the research project “Die (Ohn-)Macht des Stärkeren. Thukydides und die interpolitische Ordnung” based at Friedrich-Meinecke-Institut, Freie Universität Berlin. From 2013 to 2018 he was Juniorprofessor in Ancient History at Freie Universität Berlin. At Topoi he was involved with research group (B-1) Routes – Water – Knowledge which deals with the infrastructure of ancient water routes. His research focuses on ancient law of nations, foreign policy, constitutional questions as well as historiography. Wanderer, kommst Du nach Sparta oder nach Stalingrad? Thucydides as a "Statesmen's manual"? Herodot als Vater des politischen Realismus?